Remembering Vinod Khanna, we pick the best flicks featuring the actor whose demise has left Bollywood in shock. Veteran actor and BJP politician Vinod Khanna passed away this morning, leaving a void in the hindi film industry. Amar Akbar Anthony starring Vinod Khanna, Amitabh Bacchan and Rishi Kapoor came to be a landmark movie in hindi cinema, preaching religious tolerance. The film was a blockbuster and left an imprint on pop culture with its music and one-liners. Vinod Khanna who played the role of the hindu brother Amar Khanna in the movie won the applause of critics and cinema goers who will come to remember his role for years to come. This 1973 hit features Vinod Khanna as a valorous officer whose deadly sins of wrath and envy leads him to his impending doom. He kills his wife and his friend when he sees them together, overwhelmed with the feeling of betrayal but is later repentant of his crimes. The film has an open ending, with viewers left to decide the fate of the hero who was destined for the gallows. More than 40 years later, fans still hum to Maar diya jaye ya chhod diya jaaye, a catchy song from the movie Mera Gaun Mera Desh. 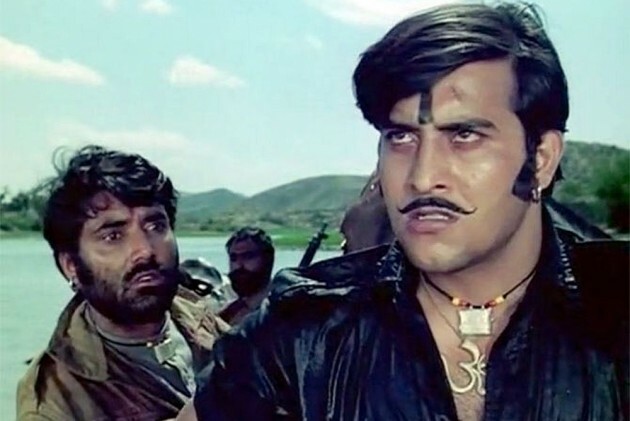 Vinod Khanna plays a village goon in the movie, the antagonist to hero Dharmendra. As Jabbar Singh, Khanna made the audience love to hate him, so much so that fans couldn't help compare him with the villain of all times, Gabbar. The movie is a reminder of the all-powerful role of fate and the true value of selfless love and friendship. Vinod Khanna plays the role of a lawyer and a best friend to Amitabh Bachhan, an orphan. Like many classic Bollywood romances, here too, both heroes are in love with one woman but they are unwilling to hamper their relationship for the common love interest. The movie ends with the death of Amitabh Bachhan at the venue of his best friend's wedding with the love of his life. Redefining the quintessential Bollywod family drama, Mere Apne brought a twist to filial relationships. Vinod Khanna plays Shyam, the leader of a group constantly in a fight with the other group led by Shatrughan Sinha's character. The movie ends with the death of their mother surrogate from an accidental gun fire in one such clash. A romantic drama film, Chandni won the the National Film Award for Best Popular Film of 1989. Starring Sridevi alongside Vinod Khanna and Rishi Kapoor in the main leads, it is thought to be one of the most successful Bollywood films. Chandni reunited Khanna and Kapoor after their last stint in Amar Akbar Anthony, another phenomenal film. Vinod Khanna plays the role of a wealthy widower who falls in love with his employee Chandni, played by Sridevi. He is a selfless man who lets go of the love of his life when he realises she is in love with someone else. Dayavan captures the story of a criminal with a conscience. The 1988 Hindi thriller was popularly known for the sizzling chemistry between Vinod Khanna and Madhuri Dixit. Shakti, played by Vinod Khanna is a don with a good heart. Disillusioned with the police force and in utmost hatred for Ratan Singh, a sadistic cop who kills his kind caretaker Karim Baba, Shakti vows to be the one and only don of Mumbai. He, however feels that no danger can befell him since he has a good heart. As the movie progresses, he will come to know that that's not exactly the case. Although Vinod Khanna is often regarded as the macho man of the 70s and the 80s, his work in recent Bollywood cinema deserve no less appraise. Vinod Khanna plays the role of Salman Khan's step father in the film that became a nationwide success.